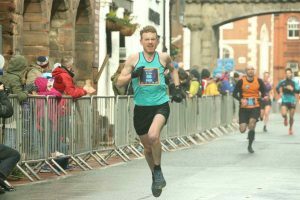 Paul Thompson reports: Start line of the 2019 Chester 10K on a stormy, biblical and unholy early Sunday morning. Mark Ince of BRAT jumps into the pen. Surprised to see a fellow Birmingham runner I grab his attention. His partner is from Chester and I say this is my home town as well. That’s not quite true, moved here when I was 11, my dad’s last army posting. Living on camp, missing those formative primary school years I was always something of an outsider in the village where we settled. A “citizen of nowhere” according to Theresa May’s rhetoric. The now familiar feeling of anger surges up from my stomach on that thought. Should help add to the pre-race adrenalin, I suppose. Turns out we are both trying to qualify for the English Masters teams at our local Birmingham 10K in May. A finish in the top 3 positions of our respective age groups is required. Today is the Trafford 10km, I’m hoping the faster masters do that instead. Get my pre-race excuses in early – missed 2 weeks of training due to a sore toe. Stretch off my thigh and lose my balance, nearly falling over, still a little bit inebriated from the beer festival the night before. Good to catch up with an old school friend though. Many half familiar vests from the North West and North Wales surround me. The occasional vest from further afar as I spot some runners from Wolves and Bilston and from Bristol and West. Race starts, rush of cold damp air in the lungs, here’s hoping I can hold down last night’s ale. Feeling grateful that I had made the portaloos beforehand though. Course turns sharply downhill, remind myself that speed is cadence times stride length, doesn’t feel like I have much of either at the moment. Mark disappears in to the distance as we start going back uphill. The smattering of hardy spectators do their best to spur us on. Check the third Kilometre split – 3:52, it was uphill but won’t be looking at my watch again. In the countryside now. Rain has stopped enough to already allow the flooded roads to drain. The shires really do get better resources than the big cities? Mind starts to drift still further, the usual stuff – why the man ahead is hairy on one shoulder only? Why do the men always visibly accelerate when passing the leading woman? Approaching the top of the uphill, not far from my mum and dad’s house. Manage a wave and a smile to my mum and daughter sheltering under a huge umbrella. Starting to feel better knowing it’s mostly downhill from now on and the toe doesn’t hurt too badly. Passed for at least the third time by a “surger”. From the support in the village sounds like from a local club. Surely he will tire? Starting to get irritated now, after all no one likes a “surger” do they? I accelerate to get away to the next group ahead passing, by chance you understand, the leading woman. Back now on to the main road down to Chester. Thunderous support from the bulk of the field on their way up. Try to ride the noisy wave. Pass the last runner going the other way, a line of trucks and yellow vested workers, packing up equipment, mass threateningly behind her. Back on the flat, I high 5 some of the dedicated supporters on the roundabout, hangover is clearing and there’s less than 2km to go. Uphill again, counting strides to distract me from tired pain. Damn those Romans and their strategic placing of defences! Get overtaken on the hill by a man with no visible calf muscles and wonder why do I bother going to the gym? A flatter section, time to recover before the final push. Scan the runners ahead to see if I can gauge their age categories from behind to see which ones I should focus on. Counting the number of neck creases like rings on a tree trunk. See an Ellesmere Port runner ahead, if I can get to the top of the final hill before him doubt he will have time to get back. Go past him early, legs starting to wobble but hold on and make the corner first, no way he catch me now. The runners ahead are too far to reach so I try to enjoy the last 100m and the vocal Cestrian support. The organisers gathering at the finishing line shake hands with the runners to thank them for turning out, it’s the little things that make the difference with these up and coming events. Too tired to notice someone has put a finishers medal round my neck. A weighty thing. I imagine it anchored to the bottom of the sea with marine life struggling to free itself from the entangled ribbon. I collect the t-shirt, at least I’ll reuse that. Collect the goody bag, consume the sweet contents. Briefly chat to some masters runners as they try to reconstruct where in the race they had finished. Not too bad considering lack of training but know later I’ll be a little annoyed when I see what might have been if I hadn’t kicked that skirting board! Head back to my parent’s house along the Lord Beeching inspired cycle path (used to be a train track). Go past places that I remember when they literally were just fields. The sun comes out. Pass the cemetery. That’s another reason to run, I’m probably over halfway to joining the runners resting there, so I should run while I still can. I come to a stop by the military graves. They died so we might be free to run? Then I continue on my way, glancing down and wondering if the drains labelled “foul sewer” on the path are particular to Chester?